At a recent wedding the bride commented to me that she had seen tons of sparkler wedding photos and she wanted something a little different. I don’t blame her! Every bride wants to make sure that her wedding is a little different from every other bride’s wedding. So I had to do some thinking and we decided that steel wool photography would work, but I figured we’d throw a little different spin on it with rainbow steel wool photography! I’d tell you how we did this rainbow steel wool photo but I have to keep some secrets!! Let’s just say it’s a lot of heat, a lot of spinning and a little magic! 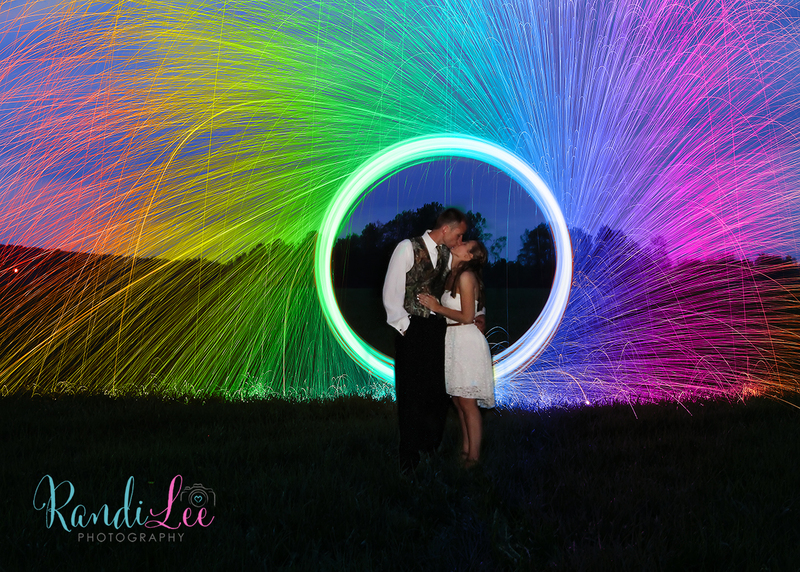 What do you think of rainbow steel wool photography? Okay so I’ve shown some “sparky” photos before and had a lot of people asking how we did it – the secret is steel wool! Steel wool photography has been around for awhile, and there are a lot of fun things you can do with it, but I’ve been having fun using it during weddings! Anyway, my fabulous assistant Erica did me a huge favor by getting a quick little video of what it looks like behind the scenes when we do a shot like this! You’ll hear me yelling, “go go go go go!” and that’s because Scott tends to slow down when he’s spinning, when I often need him to go faster!